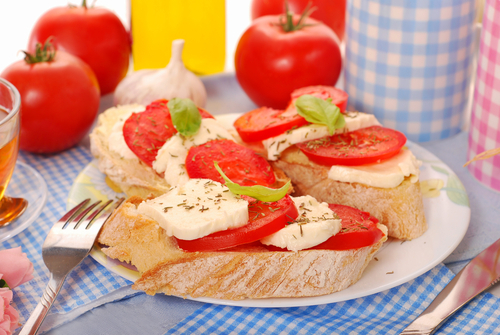 There is nothing better than eating a Tuscany-style tomato and mozzarella sandwich. This quick and easy lunch offers a great source of Vitamin C and calcium. Place bread on a baking sheet and cover with fresh basil. Drizzle ½ tsp Italian dressing on top of the basil leaves. Top with mozzarella cheese and broil until cheese melts and starts turning brown. Remove from oven and arrange tomato slices on top. Drizzle with remaining Italian dressing and enjoy. Nutritional Benefits: Healthy Fat, Vitamin C, Calcium.